This little set consists of recolors of the EA BG Counter Culture counter, Loft Curtains (also colors The Ultra-funky shown here), and Black&White Collage; EA SEA oven mitts; and the EA UNI bulletin board. I've used CTNutmegger's Maxis-Match Upper Cabinets and Mary-Lou and Numenor's Counter-Culture Modular Kitchen to get the effect shown here. You also get a recolor of CTNutmegger's 1x2 tablecloth from N99 Forum Paks (mesh included, and I use Helle's repository set HERE), Figaro_Black's Petite Dining chair from Black Pearl Sims (meshes included with thanks), and RgdyAnne's 1x1 backsplash from Sims2Artists forum (mesh not included, get it here). OMSP's used to place clutter. Wow, Kate, how come I never saw this before? LOL.....I see it now!!!! Hi Kate, I was downloading your beautiful set. Only one problem, the link to N99 takes me to a different site. Has the Neighbourhood99 closed down. I was unable to get the mesh for the tablecloth. :O how silly of me! I never thought of checking the file first!! But thanks, the file is indeed included! 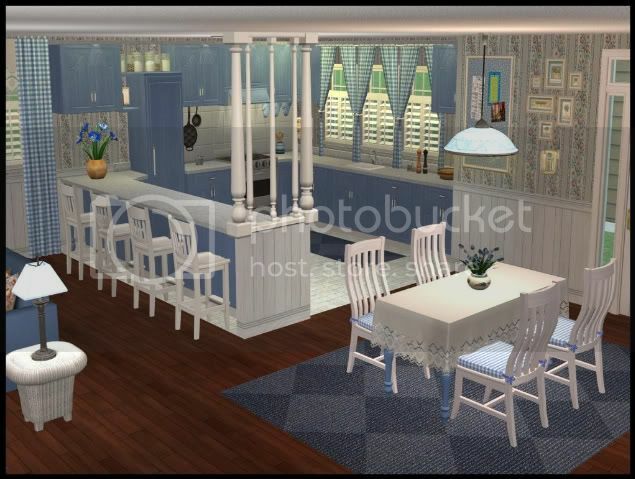 Thanks for reminding me of this beautiful kitchen, Rosebud63! It's graced many of my happy simmie homes! If you like the wallpaper, others can be found among the many beautiful things created by the staff of the now-closed Thyme2Sim forum--all generously archived by Laurie on his Simtopia forum. Lightheart, you are such a sweetie for giving me this link. The walls are indeed gorgeous!! I'm delighted to find my kitchen still here! And with one of my own lost walls, as well! This was always a favorite in my old Simmie households, and now my new Simmies can have it, too! I've grabbed it with gusto. This room was always a !